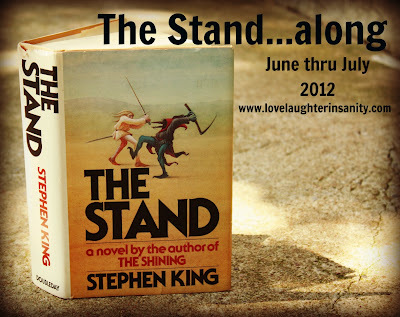 Oh, heck YEAH, I'm joining Trish's readalong for Stephen King's The Stand. This will be perfect for The Stephen King Project that Kathleen and I are hosting this year. The Stand is a book I wanted to read this year anyway, and I thought I'd be reading it more in the fall, but hey, if there are going to be a bunch of folks reading it around the same time, then sign me up! There are two versions of this book, with Stephen King expanding on the story in 1990. I'm going with that "uncut" version for this readalong and I am stoked. I've heard that this is *the* book to read if you want to read Stephen King. How: However you want. Original (shorter) version, Uncut version, Audio version. What makes you want to read The Stand? It's one I've always wanted to read, but my enthusiasm ramped up even more so since Kathleen and I started The Stephen King Project this year. I've heard it's the book to read! Describe your preconceived notions of The Stand? It's insanely huge, it's going to consume my life, and I am so READY. What was the last scary(ish) book you read or movie you saw? I love, LOVE scary books and movies. The last really scary book I read was another Stephen King book, 'Salem's Lot. That one had me looking over my shoulder. Which version of the book will you be reading? I'll probably do a combo of the hardback from the library or ebook version. What are your previous experiences with Stephen King? I've been reading a number of his works this year because of The Project, so I feel I've been getting a good education on his writing style. Which I LOVE. Anything else you'd like to add (bonus points for being extra random). Stephen King is the MAN. So why not join? Let's have fun with Stephen King over the summer! This book is my second favorite of King's after 11/22/63. I think you will really enjoy it! Good Luck with this one! I know I won't be able to join in, but I wish you much success! I am glad to get the kick that I need to finally read a Stephen King novel. This event should be a lot of fun. I am looking forward to the discussion opportunities. My thoughts exactly...this book is freakin' ginormous!! I already read this and I had to be browbeaten into doing so, but I really am glad I read it. King has such a way of constructing interesting and unforgettable mini-stories of side characters, and though they probably could be edited out, one finds one doesn't want them to be! Enjoy. It remains one of my favorite books in general, and definitely at the top of my list for King books. Oooh, have fun! I haven't really had an urge to pick up more King novels but your enthusiasm is so infectious I might just have to! I'm glad you're joining in and hopefully you can give the rest of us some context of how this book stands compared to the rest of King's work. Fun!! This will be the best way to finally reread The Stand. I'm joining in! I'm so happy you're joining! It's HUGE, isn't it? I'm surprised I was able to wait until June 1st to read it, but I'm glad the day is finally here. I am ready! I can't wait to hear what you all think of the book!